About a year ago, renovations began at L'Enfant Promenade, the retail area at L'Enfant Plaza. The first phase of renovations include a new food court near the Metro entrance. As a result of the renovation project, the 9th & D Street Metro entrance temporarily closed yesterday and will remain closed through December 8th. The closure will allow the installation of new windows facing the HUD building that will add more natural light to the promenade. Phase one will open January 2011 and then phase two will begin, which includes the remainder of the promenade and the installation of a large glass atrium to replace the pyramid currently used as a skylight. Nationally-recognized retail will open in the second phase - no restaurants have been announced yet for the first phase. The second phase won't open until fall/winter 2012. Earlier this week, JBG released an updated rendering of a 650,000 SF office building planned for the plaza itself, which is much bolder than the earlier design for the building. The atrium will be located between the two sides of the office building. It is designed by SmithGroup and will aim for LEED-Platinum certification. The developer will look for a federal tenant for the space, since Southwest is considered to be the "Connecticut and K" for the GSA. Update: There was an article in the Washington City Paper about whether I.M. Pei would get a say in how L'Enfant Plaza gets redeveloped, or if new buildings are proposed for the complex, since he designed most of the buildings. 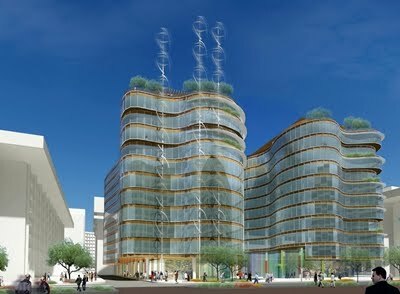 An example used in the article was a proposed campus tower at NYU among a complex of towers designed by Pei that was nixed by planners after Pei expressed his displeasure with the design. It would be great if the walkway around the south side of the HUD Building could be reopened for Southwest residents to have easier access to L'Enfant Plaza. For Southwest residents west of Sixth Street, a revitalized L'Enfant Promenade would be an even more convenient shopping and dining option than the new Fourth Street outlets. Anyone else think the new rendering a little ugly? I don't think the new rendering is ugly. I think it's fantastic - airy and modern. However, if there's a problem with it, I think it's that it will stick out like a sore thumb in the middle of all that Brutalism-style architecture. That is not to say, mind you, that I think any new buildings should be as stark, foreboding, and ugly as the existing concrete boxes that are there. I wish the existing ones could be torn down, but I'm guessing like a lot of other ugly architecture in the city, it's probably protected by some special designation from a historic preservation group. If not torn down, it would be nice if their facades could be altered, as recently occurred at the former DOT building (now Constitution Center) and Arena Stage. If the existing buildings can't be torn down or altered, due to historic preservation or just economics related to cost, I'd like to see new buildings that somehow "bridge the gap" - something clean and modern that will somehow not look completely out of place with the old and that will also not make the existing buildings stand out as even uglier in contrast to the shiny new buildings that go up around them. I don't know if it's possible to achieve such a thing, but I would imagine that a great architect could. On the topic of I.M. Pei, why should he get a say in any new development? He is responsible for the design of many of the buildings in the city, such as those at L'Enfant and elsewhere in Southwest, that are considered to be an eye sore by many people, myself included. He's an architect, not royalty and not a god. If his buildings remain standing, fine, beauty is in the eye of the beholder. That's his impact on the cityscape of Washington, DC, and that's a part of history. However, I see no reason why he should get some special consideration in any future development unless he is the owner or developer of the land. I dont' think new buidlings should be crammed onto the outdoor plaza at all. Instead, the existing groundfloor space alongside the outdoor promenade, such as the space formerly occupied by PNC Bank, and the space currently occupied by assorted small offices, should be redesigned and opened up to retail and restaurants with outdoor cafes. The open space, which is good for gatherings, lunchtime concerts, etc., along with the pyramid, should be preserved.